Edward Hopper (1882–1967) produced some of the most enduringly popular images in American art. Throughout his career, he created quiet yet riveting pictures that express both sense of isolation and uncertainty and the bittersweet comfort of solitude. His images of apartments, diners, and movie palaces reflect American urban life between the world wars, while his light-filled watercolors of New England evoke that region’s austere beauty. Born in Nyack, New York, Hopper did not come to artistic maturity until the mid-1920s, an age whose celebrated prosperity, enjoyed by the few, gave way to the Depression. Avoiding direct social commentary, his work reflects the contemporary interest in ordinary people and unexceptional places—subjects that in his hands became both evocative and insightful. The tall and taciturn artist painted images that have been described as spare, disciplined, honest, and even puritanical. Working slowly and deliberately, he pared scenes down to the essentials. While his paintings seem empty and silent, they are filled with an underlying tension, so that the slightest action—a gently rustling curtain or a piano key struck absently—takes on a mysterious significance. Hopper, an admirer of poets Ralph Waldo Emerson and Walt Whitman, believed as they did that an artist should seek to express his own individual perspective on the world. His only mature oil self-portrait offers a look at the persona he chose to present to his audience. Painted during the period of his first successful solo shows, it provides no reference to his artistic profession. 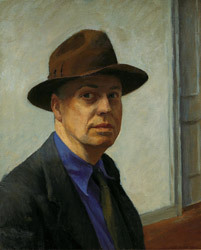 Instead, Hopper depicted himself in a casual soft-collared shirt, with a wary expression made more inscrutable by the shadow of his hat across his eyes. Portraying himself as a man of the world taking its measure, he appears distrustful of success so long in coming. Edward Hopper. Self-Portrait, 1925–30. Oil on canvas. Whitney Museum of American Art, New York; Josephine N. Hopper Bequest.